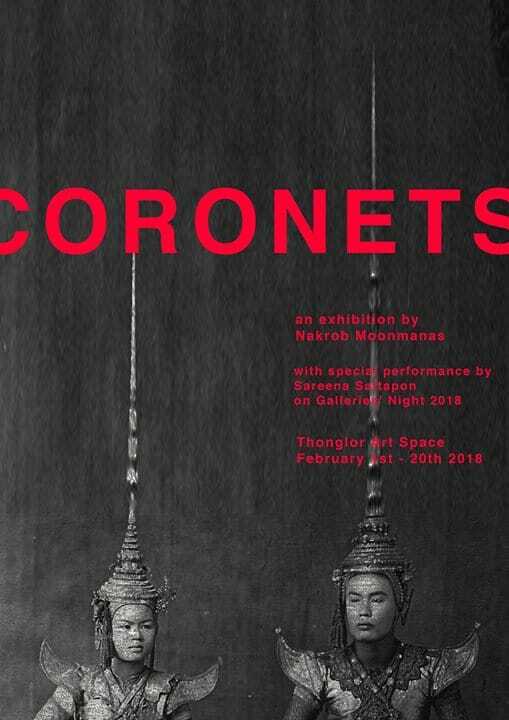 Thonglor Art Space is delighted to announce our first event of the year, “Coronets,” a solo exhibition by Nakrob Moonmanas, on view from 1st February to 20th February 2018, with a special performance by Sareena Sattapon on 10th February as a part of Galleries’ Night 2018. Moving away from his well-established 2D collage illustration art, in Coronets, Nakrob introduces his first full-scale installation art exhibition, toying with the classical object – a “chada”. The work examines the chada as an embodiment of power and fantasy through the perception of Thai culture. Coronets studies both physical and abstract elements of a chada – its extensive height, elaborate gold decoration, and the weight on the wearer’s head, as well as allows the wearer to take a role in fantasy tales of old, and assume the sense of the dominating power that it offers. With deep respect and personal interest in history and Thai classical art, Nakrob invites the viewers to take on a forbidden task of interpreting a chada, a high-art head ornament frozen in time, as a contemporary art object on display, free from its firmly-intertwined context of royalty and its associated dance. Instead of being made from solid gold, typical chada in the modern context are made of a papier-mâché type material decorated with gold paints and mirrors. Apparently without inherent value, chadas can commonly be found in commercial performances, as film props and in “Ram Kae Bon” ceremonial dance. With this motive, the chada featured in the installation has been made by a veteran local chada-maker with an exaggerated and intentional distortion. Likewise, an ‘uba’, a flower decoration on the ear of the chada-wearer, has been transformed into long lines of flowers, curled up on five spots on the exhibition floor, signifying the five spots where the body touches the floor when one performs a “Benjankrapraditha Graab,” a five-point prostration. This is intended to provoke a question into how Thai culture systematically conditions its people into submission. Without realising that the exhibited chada is made without a sacred blessing from a traditional dance master, will the viewers be offended by it, and continue to perceive it as blasphemous act on spiritual object, or will it introduces a chance for viewers to inspect the object from historical and contemporary angles? Coronets is on view at Thong Lor Art Space every day from 1 pm – 8 pm, from Thursday 1st to Tuesday 20th of February 2018, with a special performance by a performance artist, Sareena Sattapon (Dojo), on the 10th of February as part of Galleries Night 2018.